Located on 481 foot Diamond Hill in Cumberland in northeastern Rhode Island, Diamond Hill ski area was in operation for nearly four decades. The groundwork for skiing at Diamond Hill likely dates back to 1935, when Philip Allen, C. Faulkner Kendall, and Henry Munroe Rogers offered 235 acres of land to the State of Rhode Island. It is possible that a steep ski trail may have been cut as soon as 1936 or as late as 1938. A novice slope was added for the 1939-40 season. Plans for a rope tow may have been in place as early as 1938, however it is unlikely that Diamond Hill had lift served skiing in the 1930s. A rope tow may have been installed in either 1940 or 1941, at which point the parking area was improved. 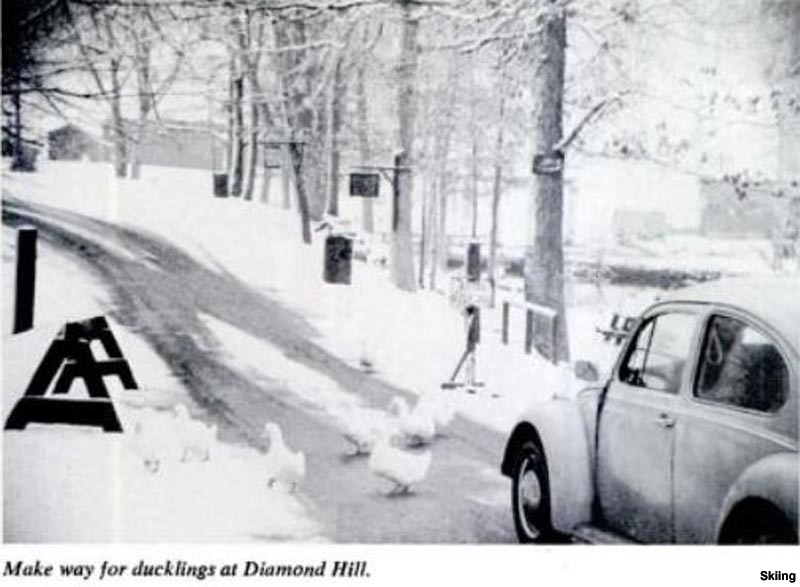 With the skiing boom taking place all over New England in the 1960s, Diamond Hill was no exception. Ski Valley opened on the back side of Diamond Hill for the 1961-62 season. Meanwhile, at some point in the early 1960s, the state likely invested significant funds in a snowmaking system at Diamond Hill ski area. While one or more seasons may have seen operations in excess of 90 days, the red ink was accumulating. 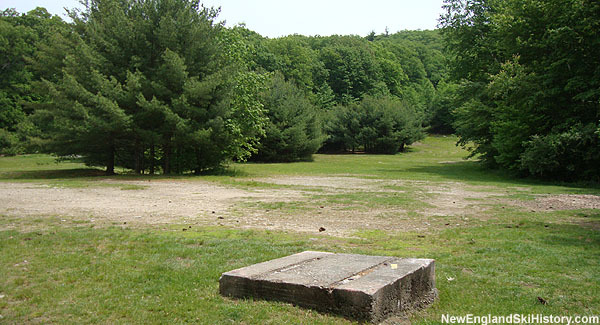 After decades of losses, the State of Rhode Island leased Diamond Hill to private operators for the 1965-66 season. A T-Bar may have been installed for the 1966-67 season. While a new chairlift was rumored for the 1967-68 season, it was still a few years away. A sizeable expansion took place for the 1970-71 season, when a new trail was cut, snowmaking was expanded, and two double chairlifts installed. Unfortunately for Diamond Hill, the expansion coincided with multiple bad winters. Stanley Marszalkowski, owner of nearby Klein Innsbruck in Massachusetts, likely leased Diamond Hill in 1976-77. It is thought that the chairlifts were removed soon thereafter, one of them likely finding its way to Mt. Watatic, MA and later Temple Mountain, NH. Diamond Hill may have been operated by the state or town as a rope tow area in the late 1970s and early 1980s, though with limited success due to poor winters. The ski area likely ceased operations prior to 1982. Neighboring Ski Valley closed following the 1984-85 season. The Town of Cumberland acquired Diamond Hill State Park from the State of Rhode Island in 1997. Since then, Diamond Hill Park has been gradually improved to provide residents with many outdoor activities, such as baseball, hiking, and the CumberlandFest. "I lived across from the Park rock face on Mount view Drive from 1965 until 1969. I went to Community School from 2nd through 6th grade. I used to ski at DH when I was a kid. I could get there on foot from my house while it took my parents to drive me to Ski Valley. Some of the names I read in these posts, Benz, Costigan and even the names on the post bring back memories. I remember hanging on the the T-bar while night skiing as it would lift you off the ground. I read the posts on Ski Valley and remember the Egans too. " "i lived in Cumberland from 1969 to 1973 and learned to ski at diamond hill. DH had night skiing and my brothers and I would ski after school every night they were open. Still remember skiing laps while the popular songs of the day were playing on their PA system. DH wasn't much but us kids loved it. And, with all the practice, we improved rapidly. Everyone wanted to "wedel" with skis together. " "The Pelletier kids all had season passes. This is where we learned how to ski. My brother Richard worked in the ski shop with the Benz family. Richard used to race down the big hill. We thought he was so cool! Wonderful childhood memories!" "I grew up across from the ski area. One of my best memories.are looking out my bedroom window at the slopes with all the lights on making snow. My bad memory is looking out my bed room window and seeing the old lodge ablaze and Mr Costigan trying to save his little dog.Now about the big hill. If you could ski that you could ski anywhere"
"I grew up in Pawtucket, RI and learned to ski at Diamond Hill in the early 60's. We first went to Diamond Hill to rent toboggans. They had toboggan chutes. This was after Squaw Valley Olympics but before the Innsbruck Olympics. There was the 'Big Hill' and the 'Little Hill'; they only had rope tows. The little hill was all we little kids could handle. To take the Big Hill to the top you had to be heavy enough and strong enough to take it to the top. The rope, without skiers, would be perhaps 10-15 feet above the ground at the point where the slope went up 'the steep part'; so kids would sit on the rope to stay in contact with the snow. Once you were going up 'the steep part', you were holding on for dear life as the rope was now trying to drag you up 'the steep part' while the rope twisted in your hands. Toward the top if you were still holding on you now had to fight the rope as it tried to pull you down to the level of the snow. It was a real triumph to ride the tow to the top. I recall a rope tow ticket costing $1.25 for night skiing." "I remember my brothers walking to Diamond Hill to ski after school from the plat across the street many winters ago, in the 1960s. Always amazed by their conquering the 'Big Hill', I soon followed, as their younger kid sister. The stories of the rope tow tearing up our mittens, falling off of the J and Tbars with the embarrassment of stopping the lift, and the memorable aroma of the 'warming hut' with the wood stove and hot chocolate for sale and wet wool socks in rubber boots are enough to make an 'old lady' revel in the good ole days. Thanks, Diamond Hill, Ski Valley (the only night skiing) and for friends and family that made those years amazing. So sorry to hear that these areas are now closed down." "Diamond Hill was on the back side of Ski Valley. As a child, we skied at Ski Valley because Diamond Hill was too steep for us. On the way to Ski Valley, we would drive by Diamond Hill, which probably had a chairlift and, to us, looked like a huge mountain with a main, wide trail as steep as a cliff. I think I may have skied there once or twice while in high school college, though we mostly went to Klein Innsbruck on Thursday nights at the time, but I do remember my brother, at least once, taking on the 'beast' of Diamond Hill with a friend." "I didn't ski enough to dare the 'big hill', but in the 50's there was definitely a rope tow on the smaller hill. The tow was right beside the toboggan shute." "I learned to ski at Diamond Hill and remember the rope tow pulling me up into the air between the gentle part and the steep part. My goal was always to follow someone with some heft to hold down the rope. I loved Diamond Hill."